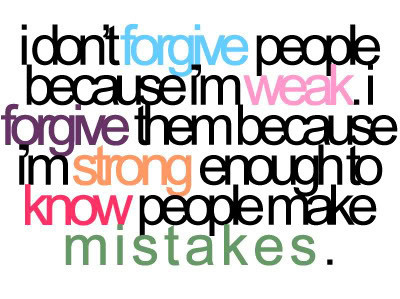 Today, I was thinking about the importance of forgiveness. Have you ever heard the saying, “Forgiveness does not change the past, but it does enlarge the future.” This is true. If we can learn to let go of our negative feelings toward others and forgive them, then our future can be that much brighter. When you hold a grudge toward someone, you are creating bad juju (or negative energy). If you can let go of those negative feelings and replace them with love, you will create Good Juju. Be aware of the energy you emit to others. Juju is powerful stuff. Strive to be happy and spread positivity to others. We were visiting one of our favorite website’s the other day, www.happiness-project.com, and came across valuable piece of advice. Today… create some good juju by being happy! Yesterday, our blog topic was “pay it forward.” We received a comment from another blogger who celebrated her birthday by performing 45 random acts of kindness in one day. How’s that for creating good juju? Her name is Merry and she has now inspired me to do the same. My birthday is coming up in a couple of weeks. I am going to attempt to perform 42 good deeds (yes, I am turning 42). I think Merry’s idea is amazing. So, if anyone else has a birthday coming up, see if you can also rise to the challenge. We found this on one of our favorite Facebook pages – www.facebook.com/Good.Juju.from.cecilia We couldn’t agree more! Many people ask us “What is Good Juju?” We love the following explanation from our friends at Happyolks. Ju Ju means energy; the experience of positive and negative forces all around us that charge our lives and shape each unique day on this planet. You know Ju Ju. It’s that thing when you enter a space and get that “off” feeling in your gut telling you it’s time to leave, it’s the woman who smiled at you when you were crossing the street yesterday, the long, warm embrace of your loved ones, the sensation of sand between your toes walking on the shore. It’s the powerful stuff that we pick up on everywhere when we let our intuition take the reigns. We can give it, receive it, create it, share it, leave it behind, pass it on; you can even give Ju Ju a good kneading like homemade yeast bread. We need good Ju Ju. We need bad Ju Ju too though. The polar forces help guide our decisions, steer our relationships, and challenge us to think about life in new, interesting ways. It’s a balancing act; I think the potential for both kinds of ju ju live in us at once and can be used to direct people when we least expect it. Some people call it vibe, at yoga you’ve probably heard it referred to as Prana… but whatever name you give it, you know that it’s some powerful stuff. Despite the fact that each day I generally rise to the blessings of good health, supportive relationships, and an intentional purpose; my Ju Ju reserves can still get a little low from time to time. Life gets messy, our heads get fuzzy, and the spark within us can grow dim. When I need good Ju Ju, I call my Mom. She shares her wisdom and light and helps re-ignite my own to honor and pass on to others. This week my Mom was flanked with a host of givers. I received more good Ju Ju than I knew how to process all at once. Surprise coverage from THE KITCHN, FOOD52, FOODIECRUSH MAGAZINE, FOOD IN JARS, an interview feature with KAILEEN ELISE, and the positive affirmations from readers and friends have been a needed nudge. Thank you. Thank you for sharing your energy with me this week. If I could bottle it, seal it with wax, and send it right back to each of you ten-fold I would. Too often we disregard the profound impact that our simple words, actions, and intentions can have on the world and one another. Don’t. Seriously. We carry each other; EVERYDAY WE TAKE TURNS BY SHARING OUR JU JU. Give it away and watch it grow. We found this article at www.teen.sharecare.com and thought the author did a great job of explaining juju. Juju has several definitions and yes it is a real term. The one I like best says that Juju is the energy or aura that surrounds an inanimate object such as a car or piece of jewelry. I like to extend it to places as well. Have you ever gone someplace and felt really good or bad about being there and all you could attribute that feeling to be was something in the air. That’s Juju. Being aware of the Juju that surrounds you is especially important if you’re dealing with symptoms of depression or anxiety. A negative environment can swiftly exacerbate your symptoms. For example, if you’re experiencing sadness or nervousness, being around bad juju will make those feelings worse. Similarly, surrounding yourself with good juju can really assist in pulling yourself out of a cycle of depression or anxiety. If you feel like your whole life is surrounded by bad juju and finding good juju is like searching for a needle in haystack than you must learn to manifest it yourself! Living a conscious life and being an active participant in your own life is essential. Try seeking out activities that promote positive energy such as walking, meditation, yoga, and gardening. Really, it can be anything that you feel good doing. Another crucial element is socializing. Many people who suffer with mood disorders are experts at isolating. Invite a friend to lunch or to join you on a hike or walk. But be selective about who you ask as people also carry with them positive or negative energy. One way to identify the type of energy one carries is to tune into your own feelings while being around them. Think about how you feel about yourself after you leave that person. If you feel better about YOU after than that person probably carries good juju. However, it should raise a red flag, if they leave you feeling worse than you felt prior to your visit. Making conscious choices about the activities, places and people in your life will help you to manifest good juju. It’s Not About How Many Friends You Have – It’s IF You Share Good Juju!